This past Easter season I delighted in a stay in a private home with a group of friends. We rented two spacious private homes a few blocks apart in the heart of this charming city of 50,000 inhabitants. Each house came with a cook and a maid, and had exquisite artifacts and decor, sumptuous bedrooms, and a serene interior courtyard garden with tinkling water fountains, all enclosed within the four walls of the spacious stucco homes. We could just step out the door of our securely locked abode to view the ongoing festivities and parades. The local processions commence Palm Sunday and are carried out on Good Friday, culminating in a candlelit Saturday night display under the full moon, and a finale on Easter Sunday. 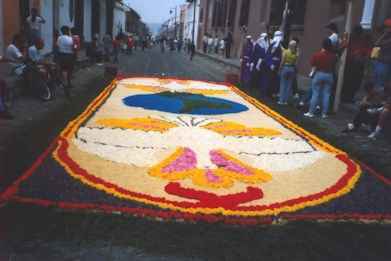 Townspeople stay up all night adorning the streets with carpets of designs in flower petals, colored sawdust and sand, pine needles and greenery. On Good Friday a procession re-enacts the progress of Christ to the Cross. 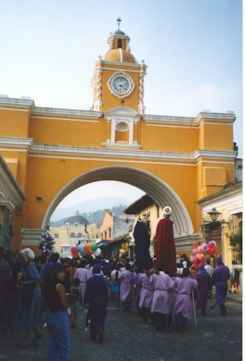 Garbed in purple robes, 80 men carry a three-ton platform bearing the figures through the streets in an eight-hour or longer walk, stopping at 20 stations for replacements for the load. Women and children follow with smaller floats. Once the design is trampled upon, it is swept up and another different one is carefully laid down by design. Thousands of people from here and abroad gathered this year, lining the cobblestone roads, to observe the pageantry and pay tribute to this century-old tradition. Security was intensified with three different police squads manning every corner with rifles and hat and ready smiles. Our days were filled with local sight-seeing, side trips, and market soirees. It was just two blocks to the Plaza Mayor, the main square bustling with pink and white cotton candy hawkers, shoeshine boys, and vendors with trinkets and handicraft galore. Around every corner on this square are shops and cozy cafes featuring a range of worldly specialties. The town market lies a block away. Here stallkeepers young and old displayed woven bags, purses, necklaces, hats, rugs, blankets, carvings and t-shirts, and bargaining with the customer was an essential reward of the sale. Young women, some with babies slung on their backs in a "tzute" (a rectangular cloth) prod the tourists, saying "I've spent enough time with you, now you must buy from me." The many old ruined churches are worth perusing as is the Casa Popenoe, a superbly restored colonial mansion showing the domestic life in earlier times. The house, set around a gorgeous courtyard, was originally built in 1634 and is open from 2 p.m. to 4 p.m. Monday through Saturday. During Easter Week it was closed, due to the great number of visitors. We took a day trip to Guatemala City by hired van to visit the Museo Ixchel, a textile museum with extensive displays representing 120 communities located in the country's highland region. The museum also features two pictorial collections, one of water colors, and another of oil paintings, on permanent display. The present contemporary building opened in November 1993 on the site of the Universidad Franciso Marroquin campus. The museum is open Monday through Friday from 8 a.m. to 4:50 p.m. and Saturday from 9 a.m. to 12:50 p.m. Tickets are 25 quetzals, or $2.50 per person for adults. The monetary unit, a quetzal, is named for the endangered sacred bird. During our stay, 6 quetzals translated to about $1. Enroute home, we stopped at a typical local roadside eatery for carnitas, tacos, chiles rellenos, guacamole and good Gallo beer, savoring a bountiful midday repast for $5 apiece. Another day, a drive to Lake Atitlan offered breath-taking scenery, marred only by a hazy sky due to a three-month drought an burning in the fields. At the market in Chichicastenango, bargains included a carved Saint Rafael holding a sword and fish ($45), and a wooden "flying" cherub tooting a horn ($25). Small 6-inch woven zippered bags were $2 and baggy pants $6. Lunch at the nearby Mayan Hotel was a prix fixe menu of red pepper soup, a special plate of rice, grilled chicken, chorizos, beef strips, and guacamole, and strawberry ice cream for $7. A short drive away from Antigua is the weaving town of San Antonio Aguas Calientes where Carolina's Weaving shop is famous for jackets, bags, belts and other weavings. Enroute we stopped to photograph the oldest church in South America, Our Lady of the Conception, built in 1534 and once buried in a volcanic eruption. Just around the corner from our home in Antigua was a textile store and retail museum of traditional Maya dress called Nim P'ot at 5a Avenida N. #29. Its name means "ceremonial huipil" in the language of Santiago Atitlan, and the shop offers the world's largest retail collection of contemporary and antique Maya dress. 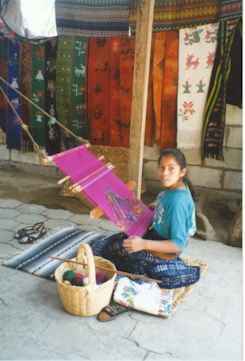 A modern Maya woman may spend months weaving her huipil, or blouse, which is her statement of identity as an individual within her community. Her peers read the subtly encoded messages of design, workmanship, and materials at a glance. The extensive collection of huipils, belts, skirts, and hair ornaments, each detailed as to place origin, makes this an intriguing sojourn. Another fine shop in town is Casa de Artes at 4a. Avenida Sur #11, open Monday through Saturday from 9a.m. to 1 p.m. and 2:30 p.m. to 6:30 p.m. It offers arts and crafts of fine quality, specializing in Indian weavings, jewelry, and folk art in a museum-like atmosphere. Accommodations in Antigua offer a range of possibilities. At the high end is the lovely Casa Santo Domingo, a luxury hotel and restaurant in a converted Colonial convent. Doubles run $150 and singles $115 per night. The Address is 3a Calle Oriente #28. The Hotel Posada de Don Rodrigo, 5 Ave. Norte #17, is a well-established hotel with rooms set around courtyards, a restaurant, and daily marimba music. Prices: $68 for a double and $60 for a single. For a delightful stay in a 400-year-old home consider the Casa de los Cantaros, a palatial mansion called a "bed and breakfast." It offers lovely semi-suites and other bedrooms around a courtyard and communal living room and dining areas. Prices range from $60 to $00 for a daily stay, less for weekly rates. Contact the charming English-speaking owner and manager, Ana Maria Pellecer, 5a. Avenida Sur #5, 03001 Antigua. Telephone: (502) 832-0674; Fax: (502) 832-0609. Most of the country has a temperate climate of 69 on average. The elevation of 5,000 feet keeps Antigua pleasant year-round. The rainy season is May through November, but conversations with local residents suggest that any season is a fine time for a visit. Once regarded as the cultural and religious center of the country, today Antigua is a haven of tranquility,and a quiet break from the energy of the capital. Another prime attraction is its dozens of language schools, some of the best and cheapest in all of Latin America. The tourist office, open daily from 8 a.m. to noon and 2 p.m. to 6 p.m., is on the south side of the plaza with plenty of literature for excursions and words of caution for safety. 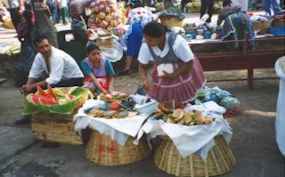 Guatemalan fare is a blend of the Spanish, Indian and European, with such French specialties as mushroom quiche and profiteroles with ice cream and chocolate sauce, alongside such native dishes as Chiles Rellenos and Chicken Pepian, the bird cooked in a pumpkin and sesame seed spicy sauce. Other typical restaurant dishes include shrimp ceviche, red snapper with cashews, and mushrooms with garlic. Flan is a justly famous dessert and hot bananas may come with a chile-spiked chocolate sauce. Our daily breakfasts featured a sumptuous platter of ultra-sweet pineapple rings, cantaloupe crescents, pink papaya spears and peeled bananas, plus pancakes or eggs any style and toast and marmalade. For lunch, a homemade vegetable soup of carrots, broccoli, spinach, corn, or green beans served as a prelude to a salad platter of sliced tomatoes and red onion rings, sprouts and avocado wedges, with a chicken or ham sandwich alongside. Vegetables starred at dinner -- sugar snaps, long beans, artichokes, and patty pan squash -- with rice and pork chops, chicken with mushrooms, grilled snapper, prawns in tomato sauce, or leg of lamb. 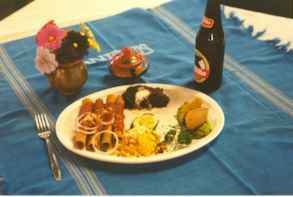 Fried plantains, flan and watermelon with liqueur were sweets. The two houses joined for dining occasionally, and our kindly house waiter dressed up to serve to table wearing a colorful native costume of bolero jacket, short embroidered pants and turban hat.